A convicted terrorist supporter who is currently under house arrest attended a Capitol Hill briefing hosted by a pro-Muslim Brotherhood group in a congressional office building earlier this month, according to reports. 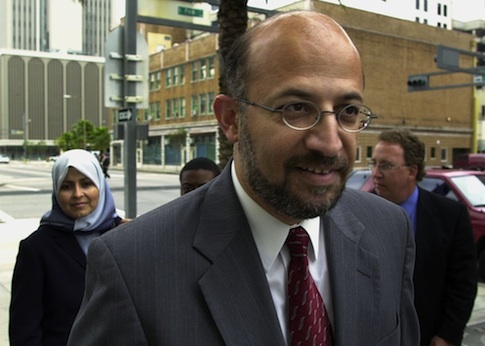 Sami Al-Arian, a former engineering professor at the University of South Florida, pleaded guilty to conspiracy to aid the Palestinian Islamic Jihad (PIJ) in 2006. He has been under house detention in Northern Virginia since 2008 for refusing to testify in a subsequent terror financing trial. Al-Arian admitted in the plea agreement to having worked with the PIJ and other groups from the 1980s to the 1990s. He said he helped assist the PIJ after it was officially designated as a terrorist organization in 1995. Al-Arian showed up at the briefing at the Cannon House Office Building in Washington, D.C., on Nov. 5, the Investigative Project on Terrorism reported. A group called the Egypt Freedom Foundation hosted the event. The Egypt Freedom Foundation recently helped organize an event at Georgetown University that featured a member of Egypt’s Nazi Party, Ramy Jan, the Free Beacon reported last month. Al-Arian’s house detention was modified last January, according to a court order, allowing him to leave his home during non-curfew hours with a monitoring device. Briefing rooms in the Cannon House Office Building are available for public events, but a member of Congress must reserve them. A spokesperson for Rep. Andre Carson (D., Ind.) confirmed to the Free Beacon that his office reserved the room where the event was held, but said Carson was not aware of Al-Arian’s appearance. "He didn’t really know anything about the room being booked, or who was going to show up at this thing," said spokesperson Lauren Burke. "He wasn’t there, nor was any staff there. We didn’t know that this person was going to show up." The Department of Justice declined to provide a comment. An attorney for Al-Arian and his advocacy group did not respond to request for comment. The Center for Security Policy’s David Reaboi contrasted the incident to terror cleric Anwar al-Awlaki’s now-infamous Capitol Hill prayer sessions prior to his becoming al Qaeda’s top spokesman. "When Anwar al-Awlaki led prayers at the Capitol, he wasn't yet known to be a terrorist. Sami Al-Arian, on the other hand, has been convicted for his role in directing and funding Palestinian Islamic Jihad," Reaboi said. "In a time when Homeland Security advisers like Mohamed Elibiary praise the Muslim Brotherhood daily on Twitter, a convicted terrorist like Al-Arian visiting Capitol Hill seems almost positively quaint. But it should still be an outrage." Al-Arian was indicted on 18 counts of financing and aiding terrorism in 2003 and spent three years in prison. His high-profile trial ended in a mistrial after a jury acquitted him on eight of the counts and deadlocked on nine others. Al-Arian later reached a plea agreement with federal prosecutors in which he admitted to one count of conspiracy to aid terrorism in exchange for a sentence of time served and deportation. Video that surfaced during the trial showed Al-Arian saying "Jihad is our path" and "Death to Israel," and letters showed him praising suicide bombings. "We have a responsibility not to allow our nation to be a safe haven for those who provide assistance to the activity of terrorists," said then-Attorney General Alberto R. Gonzales in a 2006 press release touting the conviction. "Sami Al-Arian has already spent significant time behind bars and will now lose the right to live in the country he calls home as a result of his confessed criminal conduct on behalf of the Palestinian Islamic Jihad, which is the same conduct he steadfastly denied in public statements over the last decade." Al-Arian’s deportation has been delayed as he awaits trial for a 2008 criminal contempt charge. "I hope that after this episode, Rep. Carson knows what kind of people he's bringing into the Capitol when he agrees to host Islamists like the Egypt Freedom Foundation," said Reaboi. "Rather than promote groups sympathetic to the Muslim Brotherhood, he should seek out Egyptian Copts and moderates who were persecuted during Morsi's time in office." This entry was posted in National Security and tagged Egypt, Israel, Muslim Brotherhood, Terrorism. Bookmark the permalink.